Is It Worth It to Paying Points on Your Mortgage? There are many options for people applying for mortgages, and yes…people are still getting mortgages. There may be a credit crunch, but banks still must make a living. And, that means making loans to customers. If you have good credit and a decent down payment, you can still take out a mortgage and buy a new house. The American Dream is not dead despite the doomsday news broadcasts. There are tons of options for you when it comes to mortgages. Will you take out a 15 or 30 year loan? Will you borrow at a fixed or variable rate? Will you prepay points to lower your total interest rate? When you pay points on your mortgage, you pay interest in a lump sum upfront to get a lower rate on your fixed rate mortgage. Each point costs 1% of the total mortgage amount. For example, a $150,000 mortgage will cost you $1,500 for each point that you prepay. The more points you pay, the lower your annual mortgage rate. Soldiers, sailors, airmen, and marines have a unique set of circumstances because they move around so much from one assignment to another. On average, one third of the United States’ military members and their families move every year. So, which is the best decision for Servicemembers, pay points and a lower rate or no points and higher rate? That was the quandary my friend was in recently. He could prepay one point for a 30 year fixed interest rate of 5.6%, or he could not pay a point at closing and have an annual interest rate of 5.85%. I know what you are thinking. A quarter of a one percent is not much right? But, not so fast…everyone’s situation is different and these choices should be carefully weighed. 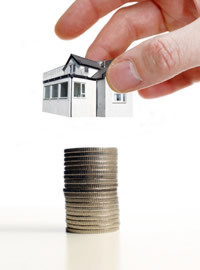 The small change makes a huge difference depending on how long you stay in the home you buy. My friend is actually moving to Washington, D.C. to work at a military base nearby. So, of course his housing costs are rather large, but the same calculations that we go through below can and should be used by everyone to weigh your options whether you are buying a home in the nation’s capital, Minot, North Dakota, Manhattan, Kansas, San Diego, and any points in between. The total loan amount for my friend is $472,000. After three years, he will have paid $81,200 in interest payments alone on a loan with an interest rate of 5.85% and no points. The mortgage will have been paid down by $18,900 (approximately $2,700 monthly mortgage payments). After five years, $133,400 worth of interest will have been paid, and $33,600 of new equity will have been created (not including down payment). Now, lets look at how much less in interest you will pay if you choose to prepay the one percent “point”. One percent of the original loan amount of $472,000 will be $4,720. At 5.6% annual interest, you will have paid $77,700 in interest payments in three years or $3,500 less in interest when compared with the other plan ($81,200-77,700=3,500). After five years, you will have paid $127,500 in interest (not including the point). So, after five years, you will have saved $5,900 in interest (not including prepaying the point). $5,900 is greater than the $4,720 you paid for the point. So, you should only prepay the point if you are going to live in your house for four years or longer. The four year point, in this example, is actually the breakeven point where paying for the interest up front will begin to outweigh the other option. So, for military Servicemembers, you should only pay a mortgage point up front on your loan if you know that you are going to be living in your new home for four years or longer. Usually, that is a long time in one spot for a lot of members of the military. For a civilian staying put in the home for the entire 30 years, it makes sense to pay the point up front if you can afford it. It will save you thousands in interest over the life of the loan. The quarter of a percentage point really does add up to a lot of money over a long time period. The average civilian home owner in America keeps their mortgage for approximately seven years, and in that instance, paying the point makes sense too. I hope this example helps and does not add to the confusion. There are several mortgage point calculators on the internet. Also, feel free to drop me a line if there is anything else I can clear up or add to this post. I’ve added the mortgage amortization table for the first six years of these interest rates to show you where I got these numbers. Roth IRA vs. Thrift Savings Plan (TSP) 401k – Which Is Better? Any information shared on Military Money Might is provided for informational and entertainment purposes only and does not constitute specific financial advice. The Website is intended to provide general information only and does not attempt to give you advice that relates to your specific circumstances. You should discuss your specific requirements and situation with a qualified financial adviser.